Surely one of Italy's most iconic images is that of gondolas being oared through the narrow canals of Venice by stripe-shirted, serenading gondoliers. These flat-bottomed boats are unique to the canals and waterways of Venice, and taking a ride in one is considered by many to be an obligatory tourist activity while on holiday in Italy. Although you will pay dearly for the experience (roughly €80 - €90 for a 40-minute trip), taking a gondola ride in Venice is sure to leave you with a warm and lasting memory of your vacation in Italy. Tourists are encouraged to make the most of the investment, however: take a trip down the back canals of Venice, and not the Grand Canal which is too crowded and impersonal; pick an ornately-carved gondola, with a comfortable seat and blankets if it's cold; and be sure to ask your gondolier if he is of the singing variety before getting into the boat - although it is compulsory for them to wear black pants, striped shirts, closed shoes and (weather-permitting) their straw hats, they are not actually required to sing. 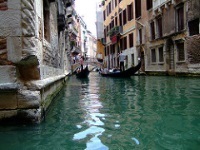 Gondolas are available throughout Venice and can be hailed as one would an ordinary taxi. If you book one through a hotel or tour company, you will probably end up paying a surcharge.